In Pahvelorn, you get XP from treasure recovered from the underworld or perilous wilderness. This happens when you spend the GP so recovered. Note that you don’t get XP just from spending money, it has to be money derived from recovered treasure. There are lots of good explanations about why this works well in D&D, but here’s one over at the LotFP blog if you’re curious. This should very much be considered a draft set of rules. 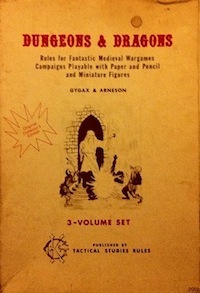 I’ve used some of these systems in play before, and the community at large has had, it seems, a positive experience with carousing as a game mechanic, but generalizing these ideas to other activities (magical research, alternatives for clerics, etc) very much seems to be an active and ongoing project (for example, see this post over at In Places Deep and this one at Kill it with Fire). Upkeep. Choose a standard of living: squalid, standard, or luxurious. Squalid gives you a -1 penalty to pretty much everything due to poor nutrition and low-quality rest. Living luxuriously won’t help you swing a sword, but it might affect some reaction rolls and may attract attention (both good and bad). Living squalidly may give you some reaction roll bonuses if you are trying to blend into poorer social groups. Preliminarily, upkeep costs per week are (rounded up, if fewer days than one week are spend in civilization between adventures): 1 SP (squalid), 5 GP (standard), and 100 GP (luxurious). I reserve to right to tweak those as I see fit. Other Expenses. Repairing or replacing weapons, paying retainers, purchasing passage on a caravan, etc. Some other referees only like to give XP for spending on things that you don’t get other utility from, but I don’t have that concern. As long as the source of the money was treasure, anything is fair game. Advertising. Advertising may be the only way to find certain specialized kinds of retainers. I will be using something similar to the system in the Ready Ref Sheets. This allows you to spend from 1 – 600 GP per week looking for special kinds of hirelings. Strongholds. Traditionally, characters build a stronghold at name level (for fighters, this is 9th level, Lord; for clerics this 8th level, Patriarch). Magic-users often build towers to study and practice their dark crafts, though name level is not as clearly defined (though it is probably the Wizard title, gained at level 11). In any case, to have the funds for such a venture, you need to start saving. Once you locate a stronghold site, even if the area is not totally cleared, you may start to put money towards its creation. Big Ticket Items. Like a ship, for example. You can take XP without spending the GP if you bank the funds with some reputable moneychanger, but if you spend that money on anything else you will take an XP penalty in the future. Maaaaaybe you can do this for strongholds too. Goals. Perhaps your character collects pottery from a particular lost civilization, or is obsessed with any tidbit of knowledge regarding elves and Elf-Land. If you spend money on a PC fascination, you can take XP for that expense. In addition, there are some class-specific ways to spend recovered treasure. In general, they work by spending GP and then making a saving throw to avoid unintended consequences (this procedure was adapted from Jeff’s carousing rules). Rites, ceremonies, marriages, funerals, naming ceremonies, consecrations, purifications, sitting in judgement, and exorcisms. I have had so many ideas for this recently, I think they deserve a separate post. Also, remember, clerics are widely respected, but as demon hunters and travelling law men, not sedentary priests. Carousing. This can be either public (a feast) or private (wine, lotus powder, etc). Competition. Wrestling, jousting, non-lethal gladiatorial combat. The specific options will vary based on location. Magical Research. See here. Money spent this way should be recorded and can be used towards magical research rolls later. Carousing. See fighter entry above. Surveillance. This should be appropriate to your character concept (e.g., an urban rogue can surveil city contacts whereas Robin Hood might be talking to shepherds and watching the comings and goings of the Sherif’s soldiers). This can get you some sweet rumors or threat level information that you might not be able to discover any other ways. Poisons. Brewing or buying; both require GP. A character may spend money in off class ways, but takes a saving throw penalty, if one is required. The side effect might be interesting… what happens when a fighter sneaks a peak at the magic-user’s grimoire and can’t restrain her curiosity? I don’t know, try it and I’ll make up some system to resolve what happens. I think that should be enough for now. This entry was posted in Rules and tagged Pahvelorn on July 28, 2012 by Necropraxis. I like these rules, but I find that PC’s advance slowly or in sudden jumps this way. Not that fight XP is great, but in my home campaign I like to give bonuses for completing tasks, seeing interesting things and accomplishing class based play/goals. I’d give a fighter 100XP for killing their first enemy in combat and a thief 100Xp for their first backstab or trap disarmed. My intent isn’t to get PC’s to level fast, but to reward smart stylish play and advancing into the dungeon/plot. Additionally I can pace encounters better if I have a decent idea when the party will be 2nd level, rather than them lagging behind due to missing the soot covered gold idol. That is a great idea. It massively simplifies treasure and carousing into one rule. So, if I understand correctly, a magic user can say “I spend 100 gold on magical research,” and a note will be made of that. And while it won’t have any effect now, it may have a cumulative effect over time? Yes, see the G+ thread for details. The ad hoc magical research does require a save versus spells (like the carousing save versus poison) to avoid unintended side effects. When a Class-based die roll is made for a character under stress, they gain Experience Points equal to the modified die roll. A character gains an Experience Point for each Gold Piece (or equivalent) they dispose of performing any function of their Class. The first part is my replacement for “combat”/”killing monsters”/”defeating opponents” Experience Point award systems. And it goes beyond those to award Experience Points for all activities that require any Class-based die roll, not just combat. The second part is much like what you’ve described in this blog post. The only significant difference is that I award Experience Points for anything of value, regardless of how it was acquired, being disposed of in any way that’s at all Class-related, no matter how remotely. But the things you list as ways of converting GP to XP correspond very closely with the sorts of things I award Experience Points for disposing of anything of value by doing, too. That’s goods stuff, but I have gone the way I have because I don’t want a particular character’s goal to be do class related things, I want the goal to be treasure hunting. Thus, all the the PCs have the same goal regardless of class. I think this is important because the game is cooperative. Some interpretations of D&D end up having problems during play because it seems like the goals of the different classes are so different (or even in opposition to each other). This is a big problem, in my opinion, with AD&D. Consider, for example, a party with a druid, an assassin, and a paladin. Lacking a heavy handed plot, those characters will not work very well adventuring together, because their goals will be different. Anyone who has ever complained about the lawful stupid paladin or the annoying loner assassin knows what I’m talking about. Class abilities are thus the tools they use to attain the goal, rather than the goal itself. Treasure hunting also emphasizes what I consider to be the theme of D&D: exploration (and, indirectly, the pacification of chaotic wilderness, which feeds into the second and third stages of the game: wilderness exploration and domain level play). That’s why the source of the treasure is important in my system; the game is not about killing rich nobles for pearls and gems, even if that might be the most efficient method of funding class-based aspirations. That all makes perfect sense. I’d probably do something almost exactly the same if my players & I didn’t actually enjoy role-playing precisely the sorts of character conflicts that you’re trying to avoid. Funny, huh?